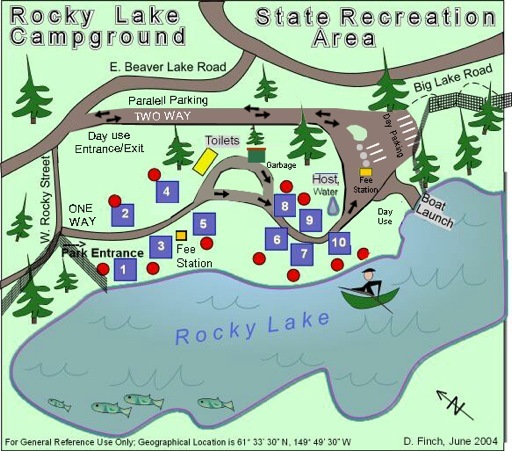 The smallest of The Bigs, Rocky Lake, has only 10 campsites for tent or RV campers, 4 sites are on the water. It's well forested and more intimate than our other parks. RV's and Campers are limited to 30ft. or less. Jet powered watercraft are NOT allowed on Rocky Lake. Driving Directions: From Mile 52.3 Parks Highway, take Big Lake Road 3.3 miles to Beaver Lake Road. Follow Beaver Lake Rd. 1/4 of a mile, turn left on Rocky Lake Dr. The park is located on the left. All sites are RV or Tent sites - Max RV or camper length is 30ft. Limit of 1- vehicle per site. 1- Medium site suitable for a small RV-Camper or 1 medium or multiple small tents, shaded. Parking size 15X25. 2- Large site suitable for up to 2-RV-campers and 1 medium tent or 2-3 small tents, shaded. Parking size (primary) 15X30, (secondary) 10X20. 4- Medium site suitable for 1 small RV or 1 large tent or 2-3 small tents, shaded. Limited parking, size 10X20. 5- Large site suitable for 2 medium tents or 3-4 small tents, Waterfront, shaded. Parking size 20X30. Lakeside. 6- Medium site suitable for 1 RV or large tent or 2-3 small tents, Waterfront, shaded. Parking size 10X20. Lakeside. 7- Medium site suitable for 1 RV or large tent or 2-3 small tents, Waterfront, shaded. Parking size 10X20. Lakeside. 8- Small site suitable for 1 medium RV or a small tent, shaded. Parking size 10X25. 9- Medium site suitable for one medium RV or 1 large tent or several small tents, shaded. Parking size 10X25. *Site 9 is next to the public water pump, access cannot be restricted. SITES 8 & 9; these two sites can be used by lager groups, when combined these sites create a large open area suitable for a very large wall tent or awning. 10- Small site suitable for 1 medium RV or 1 small tent, shaded. Parking 10X25. Lakeside. 25.00 per night #5, #6, #7, & #10. Limit of 1 vehicle per site.